Was it too much to drink or was it something more malevolent one Christmas season of 1835? Raynham Hall, in Norfolk, England, offered one of its guests a glimpse of its now famous Brown Lady one evening. As Colonel Loftus returned to his room that night, he passed a figure of a woman dressed in brown satin. Taking a closer look, he noticed her face fairly glowed and the absence of eyeballs. A small detail but it left a lasting impression upon the colonel. Years later, Captain Frederick Marryat stayed at Raynham Hall and was told the stories of her appearance. That night, he and two friends saw a woman carrying a lamp towards them down an upstairs hallway, the light of the lamp reflected off her brown dress. As she passed the men hiding in a doorway, she smiled at them, revealing the sightless holes that bespoke her apparition. Captain Marryat got a bit too enthusiastic and shot at the ghost at point-blank range, causing the woman to disappear and the owners of Raynham Hall to patch a hole in the wall and grumble about hotheads and gun control. The Brown Lady was not reported again until 1926, when seen by two boys. In 1936, two photographers from the magazine Country Life arrived to photograph the house. 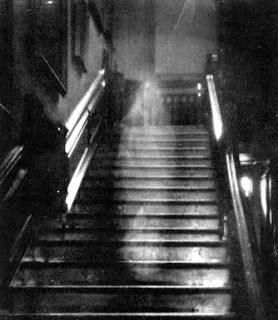 The main staircase was being photographed that day, one picture had already been taken and the photographer was readying another plate for use when the other photographer shouted that he could see something descending the stairs. It looked to be a woman in a veil and was coming quickly towards them, Provand took the shot at the command of the photographer holding the flash-gun and did not see the figure, when he looked up, she was gone. When the photograph was developed, however, it showed a dim shadowy figure on the stairs. No features can be seen, especially her lack of eyes, but the outline is pronounced.